Happy anniversary! Here's to hoping next week brings a happy anniversary eve! Guys, that Thunder Force AC track was so Bonk! I love Techno Soft music. So much so, that I'm going to be on the Pixelated Audio episode that airs August 1st, to specifically talk about my favorite Techno Soft game. Which reminds me: later in the episode, Emily, you mentioned listing to Pixelated Audio whilst playing Bases Loaded 2. Very cool; they cover some really cool, obscure stuff. Oh, and Josh, I don't think Sean S. (Shawn?) was saying the track didn't have much bass, I think he was wishing the bass track was more interesting or varied. Emily, I am glad that you have graduated to using a subwoofer. And it is especially fitting that you picked streets of rage to christen your new set up. When I play games as a kid, I had my Model 1 Sega Genesis hooked up to an old, 70's stereo. I loved jamming out to the sound tests and listening to great Genesis(and later SNES) tunes. I had a friend who also was into video games, and he used to argue that video games did not have bass. That argument ended when I bought Streets of Rage. When he came over that first time and heard that early 90's-era dance techno blaring ferociously through my wood-paneled speakers, I remember him saying: "I will never again say videogames have no bass." Josh, I liked your idea about finding all the missing video games in the world by having them float in the air. I used to imagine it would be cool if there was a pair of glasses that you could program so that a particular lost item would appear in its location, and everything else would disappear. So even if the item was a mile and a half away, you could find it. Come to think of it, maybe that would work a bit like escorting a fare in Crazy Taxi. Top Score: an actual public radio broadcast that covers modern game scores and their composers. Probably the most well-produced VGM show out there. It's also how I found out about LMH! VG Island: The guy covers 2 games per episode, he's got a cool accent, and has given me a few tracks I've gone on to recommend on your show(and which may be VGM Karaokes one day!). Super Marcato Bros: Two Brother/composers with an unparalleled excitement and in-depth musical knowledge. They tended to speculate waaay too much on the earlier episodes, but they've grown quite a bit in their knowledge of what's out there. 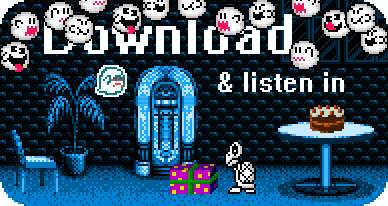 Retro VGM Revival Hour: A music-centric podcast, the announcer talks just enough to introduce the tracks. It feels like he's reading cue cards, which can be a turn-off, but man, there's some good music there. You mentioned the rest on air. All really good stuff. Pixelated Audio and Pixeltunes Radio are great at exhaustively covering obscure games on lesser known systems, and for digging up composer info that no-one else knows. VGMpire probably matches VGM Jukebox in its nostalgiosity, albeit in a different way. And LMH, because it's LMH. As for Video Game related podcasts that don't focus on music, Definitely check out Retronauts. They are kind of the front runners of game curation; I would surmise you'd both find the show enlightening. The last show I want to mention is Back in my Play. It's a show about curation and nostalgia from an enthusiast's perspective. BIMP is to Retronauts what VGMpire is to Legacy Music Hour. If I missed any shows, it's only because I haven't listened to them. Gah! I meant to say PixelTunes Radio! THAT PIXEL PROBLEM!! Man do I feel stupid about that goof-up, but I guess it just proves the point made earlier in the recording about how easy it is to say the wrong name. And thanks for all the podcast breakdowns! Wow awesome tracks in this episode! The Bayou Billy track is so good but man was that game hard. Also the Ken griffy track brings back memories that game was a lot of fun for me not being a big sports game guy. Thank you Nathan for recommending vg island I didn't know about that one. The only vgm podcast I know about that wasn't mentioned is called super marcato bros its worth checking out. Keep up the good work guys love the show! Omg u mentioned super marcato bros Nathan just ignore that portion of my comment sleepy I guess hahaha. Really surprised you guys don't already listen to Retronauts! It's probably the best retro games podcast there is! Yeah Shoryukenny, I'm terrible with podcasts. I'll check Retronauts out for sure. My getting invested in PixelTunes Radio is a really recent development, and is only the first one I've followed seriously since I fell head-over-heels for LMH -- LMH being my first. I had an interesting experience listening to this episode. While you guys were playing the Pokemon Go music, I realized that I was passing by a Pokestop, and thus ended up pausing the podcast mid-track, opening the game, checking into the Pokestop, and then resuming the podcast. As a result I ended up hearing the Pokemon Go music strangely nested within itself. It was kind of surreal. Anyway, I was hoping to hear you guys analyze this piece a bit from a compositional standpoint. To me it sounds like a possibly down-sampled version of the original Pokemon battle music with a dancy electronic backing track and some piano riffs mixed in. It strikes me as an interesting combination of a nostalgia play while also an attempt at modernizing the music. The electronic beat seems to give a walking pace to what was originally supposed to be a combat-oriented tune. What do you guys think?